Braille House Week will be held between May 7 and May 11 2019 to celebrate Braille House’s 122nd Birthday. This will be week of extraordinary celebrations! Simply browse the events below, choose which ones you would like to attend and click on the links to book. EASY! Spotty Dotty Show – This is an event for all children 0 – 5 years old and includes storytelling, music, craft and puppetry. This special Spotty Dotty show is part of the regular Spotty Dotty program that runs at Braille on the first Monday of each Month but this one will include some additional activities and even the chance to win prizes. Authors Talk – Come along and meet the authors at this very special event. Find out about the creative process and where inspiration comes from, learn about the publishing process and even ask the authors those burning questions that you have always wanted to ask. You will also have the opportunity to purchase books on the day and even get the authors to sign them. Braille House Gala Dinner – Think formal elegance, great food and wine and special guest speakers and you are starting to imagine the Braille House Gala Dinner. FREE Champagne on arrival is just the beginning of this exclusive event. Throughout the 2 course dinner you will be entertained by our very special guest speakers. A cash bar stocked with Fox Creek Wines will be available and there will also be prizes and raffles to keep you busy throughout the night. Tickets to the Braille House Gala Dinner are only $60 inc. GST so book early. Braille House Open Day and Tours – Go behind the scenes of the iconic Braille House and find out more about us and what we do. Tour our Library and see over 14,500 volumes of Braille and Moon, see the Production area and even the Binding Room. Another stop on the tour is our Children’s Library where we have a large range of children’s books including our very popular Twin Vision Picture Books. Tours are happening every hour on the hour and no bookings are required, just show up and enjoy your behind the curtain look at one of Brisbane’s most unique libraries and the work that goes into producing Braille. Braille House Masterclass – Braille House has partnered with Pure Wine Co. Wine Experience and the award winning Fox Creek Wines from the McLaren Vale region of South Australia to bring you a taste of why they are amongst Australia’s best (many say they ARE the best). We invite you to join us for a Wine Masterclass like no other. Learn about the intricacies of these fine wines and champagnes and what makes them so good. Whether you are an experienced wine taster or just interested in nice wine, this is the event for you. There will also be the opportunity to buy some to take home with you or you can order for delivery at a later date. There will also be an extra special door prize so everyone attending is in with a chance to win. Braille House Community Fair– EVERYONE is invited to the FREE Braille House Community Fair. 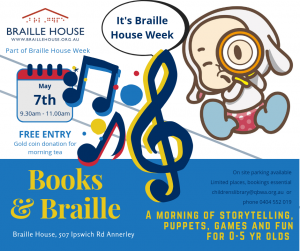 This community event will be Fun for all ages, there will be Market Stalls, Music, Performances, Displays, A Jumping Castle, Food, Local Community Groups, local Fire and Police, and Radio 4RPH will be doing a live outside Broadcast from Braille House.